Turn the clock back to 1895. The British Empire, under the twilight rule of Queen Victoria, was the world’s foremost economic and military superpower. Notable births during the year included J. Edgar Hoover. 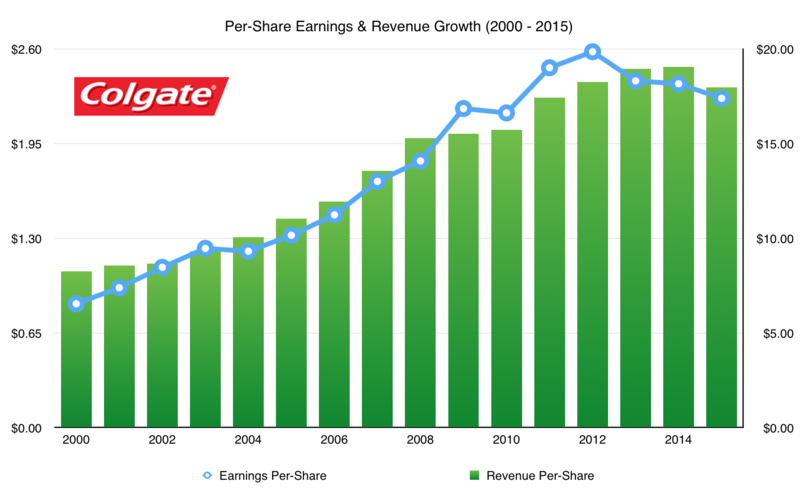 It was also the first year that Colgate (NYSE: CL) paid a dividend to its shareholders. The best bet for that kind of investing longevity is a company dealing in some kind of unbelievably boring good or possibly service. If you can find a list of stocks with uninterrupted dividends that stretch back a century then they will usually come under staples, utilities or possibly banking; all industries/sectors with incredible longevity. In that sense it shouldn’t come as too much of a surprise then that a toothpaste company that commands 40% of the globe’s market share is up in that small group of dividend champion stocks. It probably also won’t come as surprise that Colgate-Palmolive also made the top ten best investments of the second half of the twentieth century. $1,000 invested in Colgate stock in 1957 (approximately $9,000 in today’s money) would have been worth about $750,000 by the end of 2003 assuming all the dividends were reinvested. Since then that investment would have added another $1,200,000 in capital gains and about $325,000 in additional cash dividends (assuming no reinvestment). Every aspect of the business and sector is stable; from the actual operating sector – doesn’t really get more boring and predictable than toothpaste and toothbrushes – to its inherent profitability. 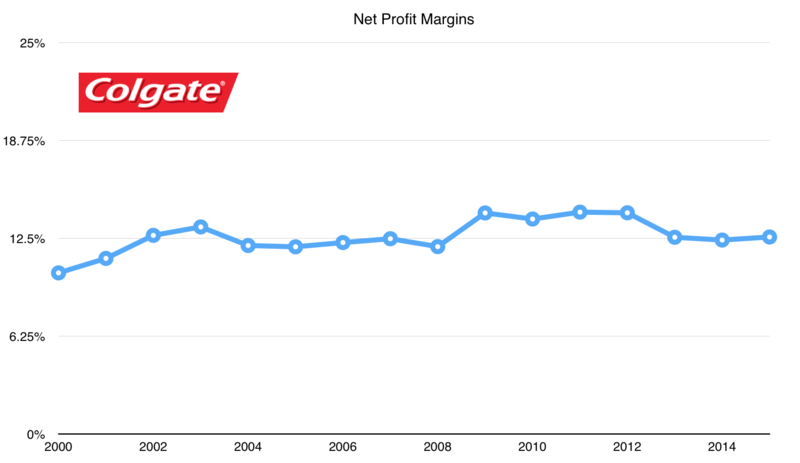 Net profit margins have hardly budged over the past fifteen years, consistently coming in around the 12% mark. That’s $12 of profit for every $100 of toothpaste revenue, net of costs and taxes, every single year. Returns on tangible capital are in the order of 50% every year such is the strength of their brand and operations. The irony of a mature businesses like Colgate-Palmolive is that so many investors write them off as no growth stocks. To do that is falling face first into the growth trap that I’ve mentioned in other articles and characterised by Jeremy Siegel in The Future For Investors. Investors spend far too much time thinking about organic growth at the expense of everything else which drives shareholder returns. Colgate with its boring history of 121 years of dividend payments is one of the best examples of this. Back in 2000 it would be tough to argue that it wasn’t a mature global business; their share of worldwide toothpaste sales was roughly the same as today – about 40% – for example, with seemingly little room for aggressive growth. The key to unique businesses like Colgate is to concentrate on cashflow rather than concepts of organic growth and treat it as if it were your own private enterprise. You’re not going to get stellar organic growth from breaking into new markets, but the quality of the company’s underlying earnings literally allows them to create their own growth for shareholders. Buybacks are the obvious example of this. In 2000 there were 1133.3m ordinary shares of Colgate stock in issue; at the end of 2015 there were 892.7m. So on average the company have ‘created’ 1.60% a year in growth for shareholders. If that figure sounds low its because the average value of Colgate stock has been 22x annual earnings during that period because the shares never gets cheap. In some years the effect is less, at times when the stock is in demand and the price is high, and in other years, in the rare times when the value is lower, the effect is enhanced. On average though the quality of the company’s cashflow allowed them to retire 20% of the shares outstanding at a rate of 1.60% a year. In 2000 the company had already been paying a distribution for 110 years – a further nod to how stable and mature the business was. In that year a shareholder was also entitled to $0.32 for every share they held, and in the fifteen years since it has grown by 10.85% compounded annually. If you were to reinvest those dividends into more stock then you would now have 1.4 shares for every share you owned in 2000. The net result is that for every $1,000 of Colgate stock bought in 2000 you would be getting $67 in dividends in 2016 compared to $10 back in 2000. That’s inflation adjusted income growth of 11% a year for the privilege of holding one of the best companies of all time. Every $1,000 in Colgate stock bought in July 2000 is worth $2,600 today. The beauty of businesses like Colgate is the stability allows you to reasonably assume that in two, three or four decades down the line not much will change. Organic growth will be lower, but the quality of the company’s cashflow allows them to fund shareholder growth in other ways. That’s why when you find yourself in periods like 2009, where you can pay $16 for every $1 of Colgate profit to get you hands on the stock, then you back up the truck. The effect of those buybacks on a lower value base will boost the per-share profit and dividend growth even more. The 121 year dividend streak in 2016 will probably be a 131 year streak in 2026, and then a 150 year streak by the time 2045 arrives. And each year your share of the profits, dividends and ultimately the intrinsic value of your holding goes up a little bit more.